Honoring Kevin Durant's alma-mater, Nike Basketball recently cooked-up a Texas Longhorns exclusive colorway of the Zoom KD IV. Rocked by the Longhorns over the weekend, the KD IV reps the "Burnt Orange" Nation nicely with a simple Texas-inspired colorway. UT's signature burnt orange hue covers most of the upper on the KD IV, while white adds sone contrast on the heel, Swoosh, outsole and Longhorns' logo on the tongue. 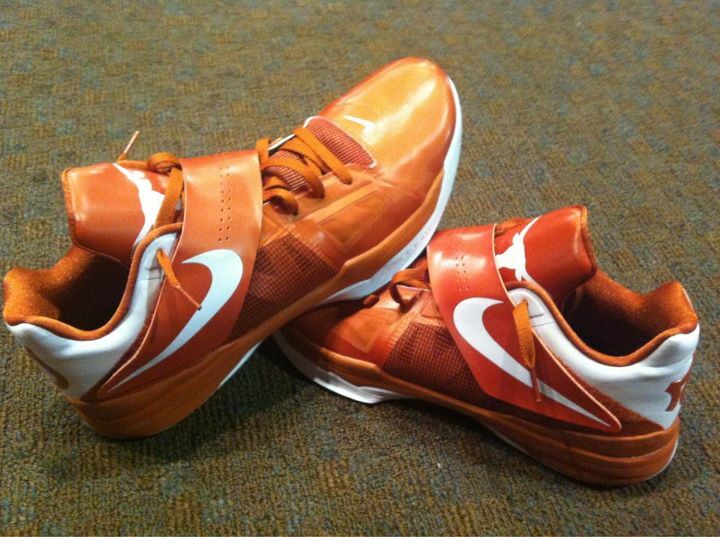 The Texas Longhorns Nike Zoom KD IV is expected to release at select Nike Basketball retailers this March.